In my continuing exploration (between fits of free verse madness) of old poetry forms, I offer here the Chant Royal, five 11-line stanzas and a concluding envoi that takes the medieval ballade, my previous post, even further. This super-fun challenge was introduced to the 14th century French courts by a well-respected author and poet who was also a woman. 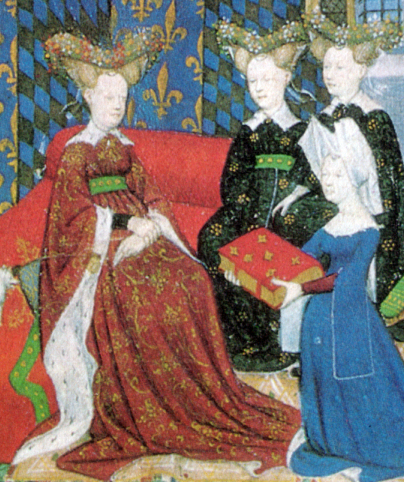 Christine de Pizan had the courage to challenge misogyny and the stereotypes of her era, no small feat considering these were the times of the Inquisition, of witch hunts, and crusades against the Cathars and other heretics. I’ll save the rhyme scheme details for the end of the poem and the die-hard poets. (I know some of you, and I appreciate you to the stars!) What I will say here is this. We have been led to believe that the so-called Dark Ages contributed little to humanity beyond castle ruins, the Black Plague, and the aforementioned terrors. But I believe that deep within those years of butchery were genuine Minds on Fire. Troubadours, jongleurs, poets, and jesters (the royal fools) challenged each other’s wits for three to four hundred years with tremendous feats of language and rhyme, and may thereby have set the neuronal cornerstones for the geniuses of the Renaissance who would follow them. That’s my theory anyhow, and I like the feel of it. I hope you enjoy “From the Silence”. please refrain from snapping like a tripwire. themselves of all the cruel bosses did. how best to send the oligarchs askid. as viewers and consumers, Idol fans. that pulses in our craniated lid. Ask anyone, they’ll tell you, I am tired. my iPod tuned to favourites from Pink Floyd. I turned them off. What was this, now destroyed? hope movies that they love will not be panned. the fun of now exists the all, no higher. Creation’s law attracts the best of it. The rhyme scheme for Chant Royal is ababccddedE with the end line repeated in each of the five 11-line stanzas and the final envoi. The envoi can be either five or seven lines, rhymed as ddedE or ccddedE. Christine added the final mind-pretzeling rule: Apart from line E, no repetition of end words!